Eleanor Hudson was born in Buxton Derbyshire, and began to learn the piano at the age of four, wanting to play the harp from the age of six. She finally got her first harp at the age of thirteen, studying with Mair Jones from the Royal Liverpool Philharmonic Orchestra, then going on to Chethams School of Music, Manchester under Jean Bell from the Halle Orchestra, with whom she continued her studies at the Royal Northern College of Music. 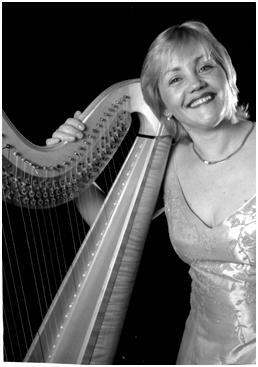 During her time here Eleanor won the Guinness scholarship for harp and was awarded the highest mark ever for harp performance. She then went on to gain a distinction in harp performance from the Royal College of Music and started to work regularly for Scottish Chamber Orchestra including a number of concerto appearances, as well as guest principal harp for the Halle, Philharmonia, Opera North, BBC Philharmonic and Symphony Orchestras. She has also been lucky enough to work with Bill Bailey, Tony Bennett, Elvis Costello, the Moody Blues and the Ronnie Hazlehurst Orchestra. Eleanor travelled to Spain to join the Malaga Symphony Orchestra for a year before returning to England to take up the post of Principal Harpist with the Royal Liverpool Philharmonic Orchestra. During her fifteen years here she performed numerous concertos, was part of the original 10/10 contemporary ensemble and also became very committed to the Phil’s education programme. Eleanor has recently left the RLPO to return to freelancing and having retrained as an SEN music teacher runs music projects in schools as well as taking on the role of Harp Tutor at Chethams School of Music. She is currently a lead musician working with the RLPO /Mersey Care NHS project devising and delivering music workshops in mental health visiting many secure settings such as Ashworth Hospital.